Despite a chilly reception to Terminator: Genisys (seriously, what was up with that name? 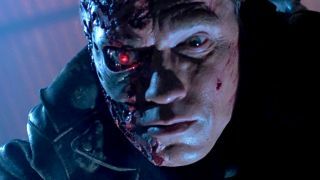 ), the Terminator franchise will continue, with filming on Terminator 6 set to commence in March 2018. The info comes from someone who should know - the original Terminator himself, Arnold Schwarzenegger. Speaking to Austrian news outlet Kleine Zeitung, Schwarzenegger said, "In March next year, I am shooting Terminator 6, James Cameron and David Ellison are back on board and then comes a Conan" (translation via The Playlist). That sounds pretty definitive to me. So is James Cameron going to direct this new installment like he did the first two? Not quite. According to Deadline, Cameron will be a "creative presence" alongside Deadpool director Tim Miller. Exactly what roles they'll be credited with are not known, probably because it's still in the pre-production stages. Either way, this new film is said to be the start of yet another trilogy (you know, like Terminator Salvation and Terminator: Genisys were supposed to be), and will supposedly resolve the conflict between humanity and Skynet. If people actually go pay money to see it, of course.